London: J. Ede, 1808. Hardcover. Collectible; Very Good. A solid, well-preserved copy of the 1808 1st edition. Tight and VG in its original light-brown boards, with professional re-backing along the spine. Light, forgiveable spotting to the text but all 32 plates are bright and completely legible. 16mo, 74 pgs. 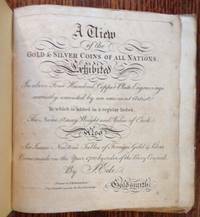 "Also Sir Isaac Newton's Tables of Foreign Gold & Silver Coins Made in the Year 1700 by Order of the Privy Council, by J. Ede"
New York: The American Numismatic Society, 1950. 1st. Original Wraps. Collectible; Very Good. The 1950 1st edition. Solid and VG in its beige wrappers, with very light soiling to the panels. 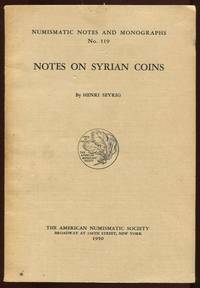 Octavo, Numismatic Notes and Monographs #119. Varanasi: Numismatic Society of India, 1973. 1st. Original Wraps. Collectible; Very Good. The 1973 1st edition. Tight and VG- in its beige wrappers, with light soilig to the panels and clear, neat tape running along the spine and at the panel fore-edges. Still though, solid and presentable. Octavo, 191 pgs.